This week one of the main jobs I wanted to get done was the back garden. Since we moved in in September it hasn't been touched. The borders were full of weeds growing between the flowers, the grass was overgrown and add in the pile of floorboards we have been waiting for the time to take to the local tip, it didn't look pretty! Our biggest problem was although Zach will happily have a long nap in the day, we still had Gracie to keep busy so I came up with a plan to get her involved. I wanted her to have fun in the Garden but without being told constantly what to do. Last summer we let her grow her own plants but they were lost when we moved house shortly after. So we popped to B&Q and I bought a few little plants for myself and spotted some single Strawberry plants and thought what better idea could we have than letting her grow her own fruit plant? She loves Strawberries which is why we chose that particular plant. 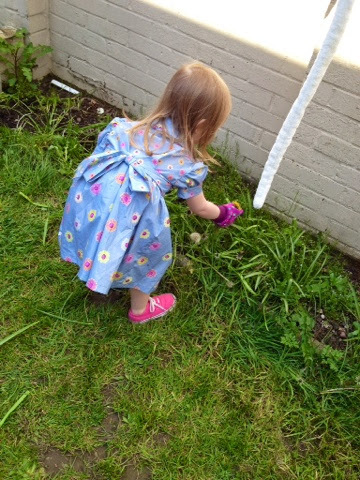 I bought a big plant pot and her own little set of gloves and she was very excited to get out in the garden. 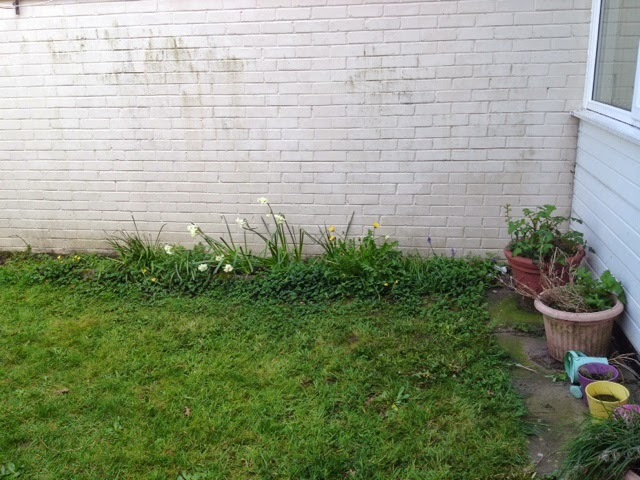 We started straight away firstly with clearing the borders. Gracie feeling all grown up, grabbed her choice of garden tools out of our bucket and set to work helping me remove everything. As I wasn't sure what was a good plant and what wasn't, we decided to completely gut it all except my small Rose bush and start from scratch. She loved helping, pulling out weeds, raking the soil and filling the waste into our bucket. We were at it for almost three hours with absolutely no complaining!! So as we had nearly finished it all we left Daddy to finish the last bits while we re-potted the Strawberry plant. I gave Gracie the pot and a small spade to fill it with soil herself then together we took the plant out of it's original pot and I showed her the roots and told her how she needs to water her plant everyday so it'll grow nice and big. She chose a little spot in the Garden to keep it and immediately watered it. Just as we had finished Zach woke up right on cue and she was so excited to show him what she had done and has been remembering to water her plant each day. She also keeps asking to go do more plants with me so the plan has obviously worked. If you haven't tried it I would definitely recommend as a nice fun activity. It has got us all interested in making the garden look really pretty. 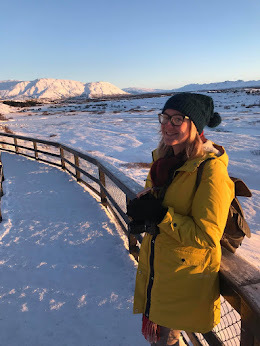 I'd also love more tips for fun in the garden if anyone has any? 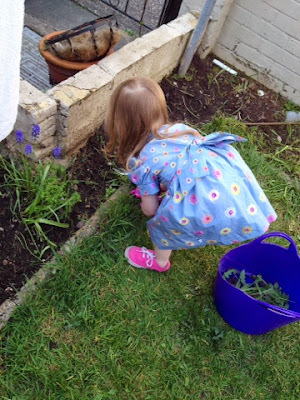 Oh look at her in her gorgeous little dress doing the gardening. Cute! 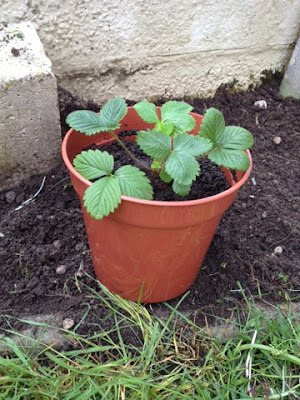 Strawberry plants are a great one, so easy to grow and the kids love eating the fruit. Have you tried buying some cheap pots and letting her paint them, or growing sunflowers and seeing who can get the tallest one? Looks like she had great fun. Oh I love gardening and being in the garden. She will love the strawberry plant and eating the fruit when it comes, so good to teach kids about growing things and where food comes from. That's a brilliant idea, to get her looking after a plant that'll produce a fruit she actually likes. Don't forget to show us photos of the fruit when it ripens! Looks like your little one had fun! I don't have a garden unfortunately but my next house will!